Roger and his family came to the East Bay from his native Mexico in 2001, when he was just 11 years old. After receiving incorrect advice from a “notario” (public notary) 8 years ago, his entire family risked deportation. Fortunately the family came to a Catholic Charities of the East Bay (CCEB) community event 5 years ago and received the help they needed. Roger was in high school at the time, and was forced to leave the country and spend 6 months in Mexico, for consular processing. However, thanks to CCEB’s legal immigration team, he was able to return to the US and is now a US Citizen. Inspired and grateful for the help he received, Roger is attending law school to help immigrants where he grew up in West Contra Costa County. This is truly an example of a family thriving directly because of CCEB. Without our community workshop 5 years ago, they might never have found a good attorney to help them, and their story might have taken a sad turn. Instead, because of our help, Roger is pursuing a career that will allow him to give back to his community by providing citizenship and immigration services. In the Summer of 2014, Roger accepted an internship with Catholic Charities immigration legal services in the West County Service Center, making a difference in many people’s lives. Imagine if your government decided to “relocate” your hometown simply because they suspected that you and your neighbors supported their political revival. Imagine if you were forced to worship the state religion or risk being imprisoned. In their homeland of Burma, Sai Lone and his wife Nan Khan found themselves in such a situation. Their only hope was to flee, first to Malaysia and then to the United States, where they were granted political asylum. They arrived with an uncertain future ahead of them. They didn’t know the language. They didn’t have jobs. They didn’t know how the system worked in their new home. Catholic Charities of the East Bay received a call from the US Catholic Conference of Bishops (USCCB) Department of Migration Refugee Services and began the process of moving the young couple from crisis to stability to prosperity. A CCEB refugee resettlement case worker, made arrangements to pick up Sai and Nan at the airport and welcomed them to their first apartment, furnished, and stocked with food. The CCEB team helped them navigate the network of social service agencies, where they received medical benefits and food assistance. Once Sai and Nan’s situation was stabilized, Tlulang Salai, a CCEB employment specialist, stepped in. Language was the biggest barrier for Sai. Tlulang enrolled him in Vocational English as a Second Language (VESL) classes and prepared Sai to interview for a job in a local Burmese restaurant. Two months after arriving in the United States, Sai and Nan have much for which to be thankful. They are blessed with the safety of the home they share. They have met supportive friends, counselors and teachers through the CCEB refugee resettlement program. Best of all, Sai was hired for a job that gives them optimism for the future. 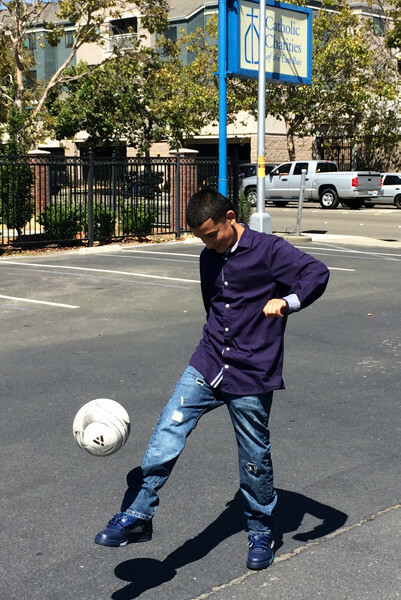 This is just one of the many lives we are changing everyday here at Catholic Charities of the East Bay. I am thankful to Mr. Salai. Without CCEB, I didn’t know how to start, but they helped me step-by-step. He introduced me to the system, so gradually I am improving. The second is Education, which is the most important thing to step up to the next level. Teacher Daniel (Crose, VESL instructor) has helped me a lot. One thing I heard before I left was how US was the richest country in the world and the largest democracy in the world and everything would be free. What I’m learning in 2 or 3 months, if you work hard, if you are struggling, if you stand on your feet and are not lazy, you can survive anywhere you go. This is the thing, just learning about yourself, I am not lazy, I can do it. Abel plans to try out for his high school soccer team. When you look back to grade school, do you recall the “good kids?” How about the “bad kids”? How strong were those labels? All too often, we categorize people at an early age, and those labels stick. As a middle schooler, Abel went through a lot changes in his life. Like everyone, Abel made mistakes. Learning from them is what made Abel into the person he is today. However, he probably would not have been able to do that on his own. Over time, that depression and fear turned into anger. Many of his friends were into gangs and he began to make some really bad decisions. He stopped going to school, and his relationship with his parents became worse and worse. “During this depression, I had no one to talk to,” he explained. At about this time, Abel began working with case managers from Catholic Charities of the East Bay. The Catholic Charities RTIPs (Restorative Trauma-Informed Practices) team was in Lavonya Dejean Middle School where Abel was enrolled. RTIPs is an approach to working together that emphasizes pro-social behavior such as empathy, self-regulation, personal responsibility, accountability and dialogue. He began meeting with Javier Arango, one of the RTIPs youth engagement specialists. Through group meetings and one-on-one meetings, they developed a relationship. They built trust with one another where Abel could tell Javier his problems. “Javier would tell me everything will be ok and that will make me feel better. Other kids would call me stupid but they don’t know how I felt,” Abel said. As an 8th grader, Abel began working with Gimone Bryant, a clinical case manager in the RTIPS program. Gimone helped him set high goals and standards for himself. Gimone was instrumental in working with Abel’s teachers and staff. Together, they stablished a silent indicator between Abel and his teachers when he became triggered in class. When he feels there’s a problem coming, he was permitted to go outside and take 2 minutes to redirect himself. By taking that time he is able to focus and avoid the problem. The result of their work was remarkable. Abel found that he could begin to redirect himself before a problem occurred. He also began achieving his goals by getting better grades in school, not acting out and getting suspended, and building a better relationship with his parents. “Working with Abel and agreeing to the two minutes outside the class room has shown that he can sense a problem coming before it reaches a crisis,” explained Mr. Bryant. Abel’s life has been transformed. He has been accepted to the Leadership Academy, a prestigious high school that accepts only 200 students per year, and has aspirations to become an FBI agent. He has a strong, loving and caring relationship with his parents. And he has dreams and goals for the future. Abel’s story is an inspiring example of perseverance, growth, and determination. Self-esteem. Empowerment. Confidence. These are all key traits to being a successful leader. For most, these traits don’t come naturally. For many immigrants in our community, language and education barriers lead to feelings of low self-esteem and self-worth. Through Catholic Charities of the East Bay’s Women’s Health and Leadership class, we work with Latina women (and men) to teach lifelong leadership and family skills. It is an intense, one-year long program where the students attend classes for 3-hours every Friday night. “The goal is to instill in these women and men a spirit of empowerment so that they can be leaders in their home, community and work,” explains Marta Olivares, Family Literacy Program Coordinator at Catholic Charities. One of the classes in the program was an incubator for small business. With her interest in health and fitness, she is contemplating a business making all-natural juices and teaching fitness classes. 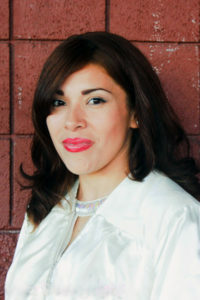 Marisol discovered an inner-strength that she did not realize was there. By overcoming her fears, she became empowered. Through empowerment, she now dares to dream.